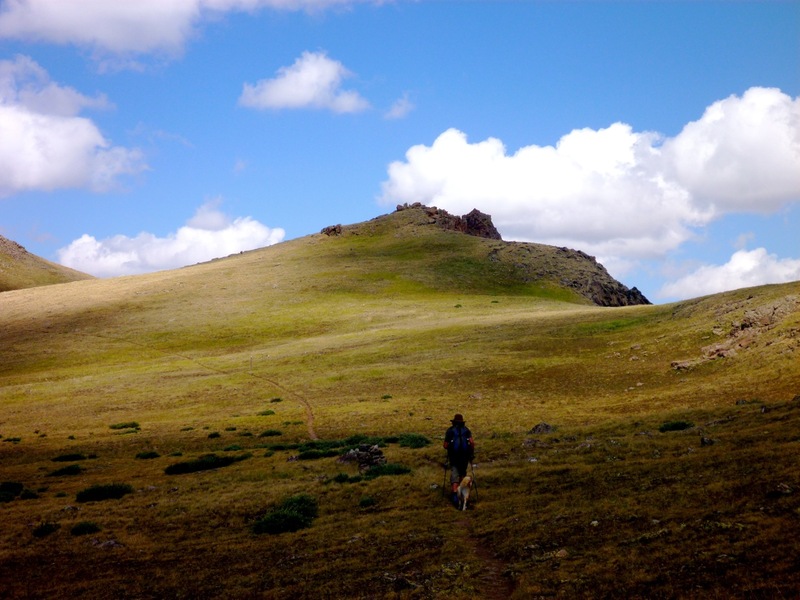 July 20 – Spring Creek Pass to Worm Lake – 22 miles, 4,744 feet up, 3,658 feet down. After hiking more than 100 miles the past four days, we both were feeling a bit groggy this morning. There is the physical side of it for sure, and the biggest thing right now is that we are constantly hungry. It's been building for awhile now, but it's become a significant issue since we've come to the highest elevation part of the trip. We are ravenous, and we are bottomless. I think we're struggling a little bit with the mental side as well. We're quite a ways ahead of schedule. 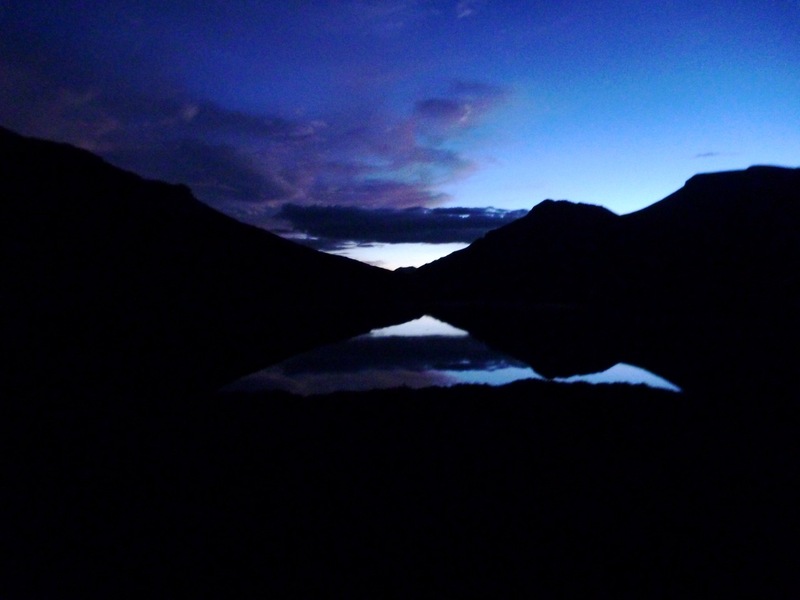 Before the trip began, I booked a night at the Molas Lake campground, as they have showers and food and they are perpetually sold out all summer long. For awhile, when Elaine's feet were acting up, there was a real concern we wouldn't make it on time. Now we have the opposite problem – we have four days to go 53 miles. It may seem ridiculous, but when you get in a groove out here it's hard to stop. I love our pattern right now – wake up at 5 am, hike for a couple hours, down a breakfast bar, hike steadily till 10 am, snack, hike another two to three hours, snack again, and then hike till we feel like stopping. I guess we could just skip Molas Lake, but we hate to waste money, and we also then run into the issue that we are booked in Durango on the 26th and are going to run into this issue for the rest of the trip. In the future, I'm going to forego reservations and just take it as it comes. Groggy though we were, it was a beautiful morning. This segment from Spring Creek Pass to Stony Pass was my favorite part of a Colorado Trail bike ride I did with a handful of friends back in '03 or '04. It's high, it splendidly scenic and it's wild. Actually, I would argue that might have been my single best day of mountain biking ever. It was good to be back, this time on foot. The initial jeep road up this section was exceptionally slick, and I almost took a bad digger that would have left me coated with a thick, clay-like mud for the rest of the day (and beyond). It would have been a lousy way to start the day but fortunately it didn't happen. 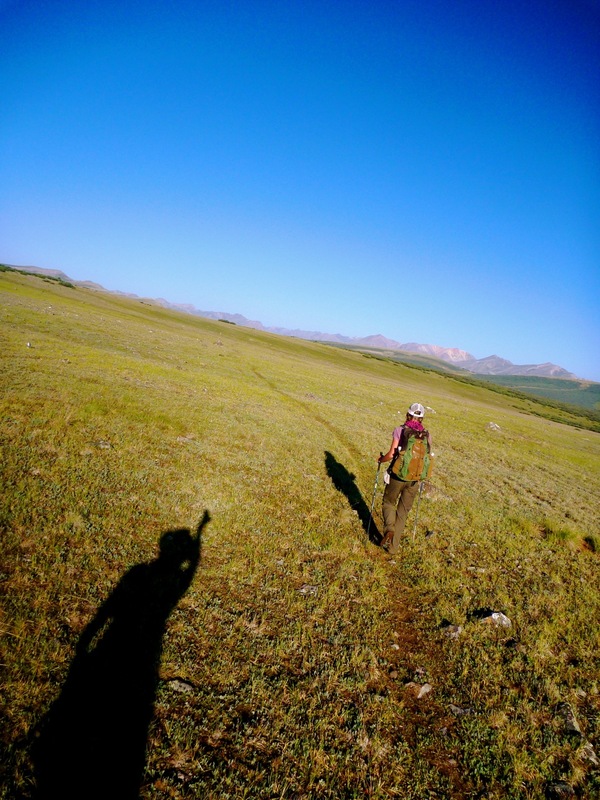 This section of the trail is a mish mash of trails, jeep roads and no trail at all, simply cairns on the tundra. We're not in Boulder anymore, evidenced by the "Kill Nancy Pelosi" inscription on the trailhead bathroom wall. Pelosi is a California congressional representative who fights hard to designate areas Wilderness, and is always getting involved in environmental issues. Alas, Wilderness is a hot button item in the west, not so much because of mining or forestry, but because it closes areas to motorized use. Personally, I'd choose to designate the whole country Wilderness and have everybody hike and live out of tents (slight exaggeration, but not by much), but not everybody shares my view. Indeed, we're in a part of the country where many don't share that view. 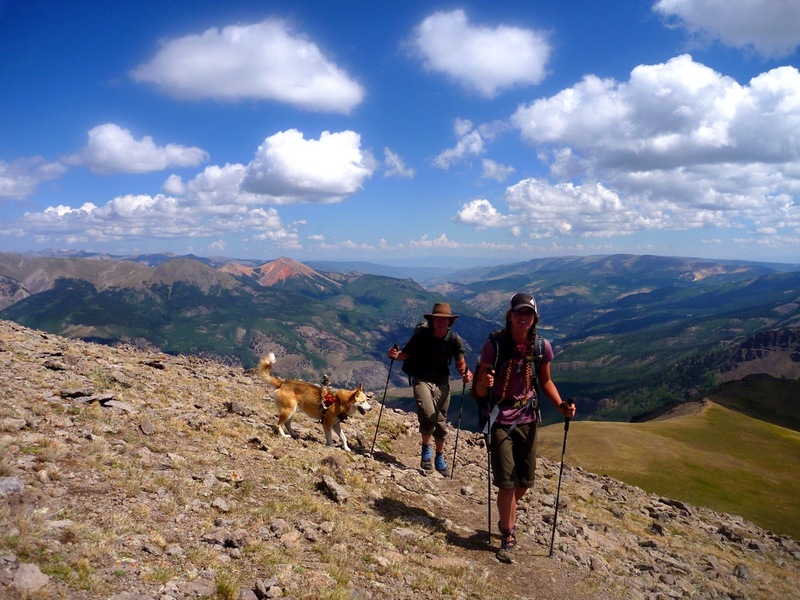 The trail climbed through pine forests before emerging onto a plateau called Jarosa Mesa. It wasn't long before we started hearing "baahing," and then, as we came upon a huge open meadow, saw a herd of hundreds of sheep. They were domesticated sheep, and as I scanned around the herd I saw shepards, siloutted against the morning sky, staring our way. These are the legendary Basque sheep herders of the western mountains. It's a little known fact, but there are pockets of immigrants from the Basque region of Spain who live in the highest mountains in the United States and herd sheep. It seems like a good life, albeit a hard one I'm sure. The shepards are a stark contrast to the scene in the Cochetopa Hills, where cattle were left to graze unattended. This is probably my biggest beef (pun) with the cattle industry. 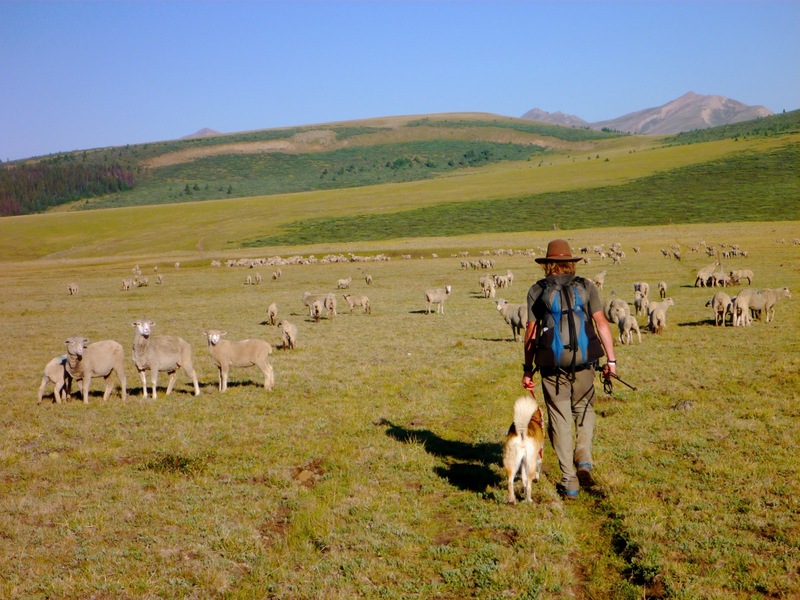 Ranchers lease huge tracts of land from the BLM for a price most of us could never dream of, to graze their cattle, and then complain vehemently when natural predators on these wild lands – wolves, bears and coyotes – prey on their herds. The solution seems simple to me. If you don't want your cows to get eaten, then be out here with them! The sheperds protect their sheep. Why can't the ranchers protect their cows? That's the solution. Yet we haven't see a single rancher tending to their cows. Instead, the cattle industry clamors to kill every last wolf, bear and coyote in the west, citing money lost from predator kills as the reason. This attitude is like taking a nuclear bomb to kill a gnat. Simply put, if the Basque sheep herders can watch their sheep, the western ranchers can watch their cows. Or, they can accept the fact that this is wild country, it's public land that they lease for pennies on the acre, wild animals live out here and cows will get eaten every now and then. 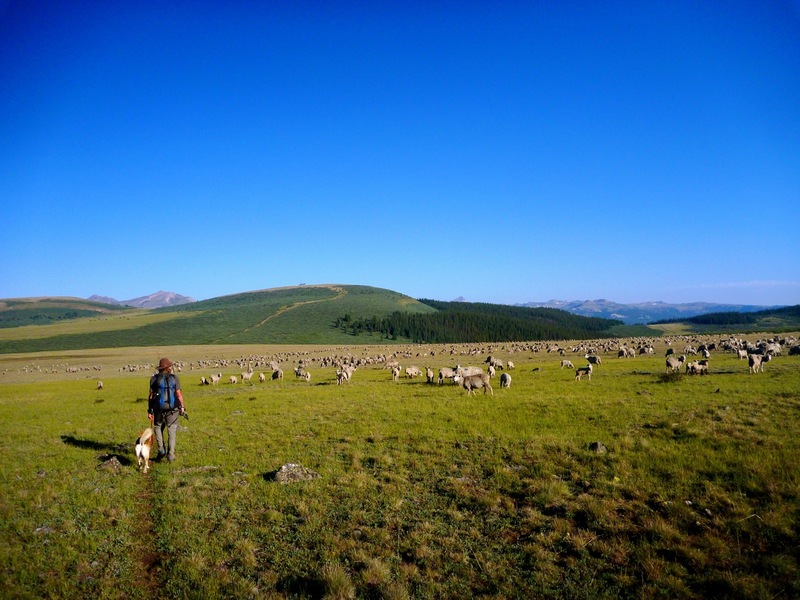 The sheep made a massive rukus as we passed, yet Stella, who I leashed to avoid the ire of the shepards and their massive white sheep dog, passed with nary a whine. She is a really good dog. Impecibly good. I imagine one of my old dogs in this situation, Sasha. She would have simply gone insane. She was a good dog too – all dogs are good dogs – but it's a wonderful luxury that Stella is as calm and good as she is, as it allows us to take her on pretty much any adventure. Sometime in the mid-morning we decided to scrap the plans to have a short day. The weather was clear, and we've already learned the San Juans can be scary as heck during thunderstorms. The storms last longer out here and are more intense than anywhere else I've seen in the Colorado Rockies. 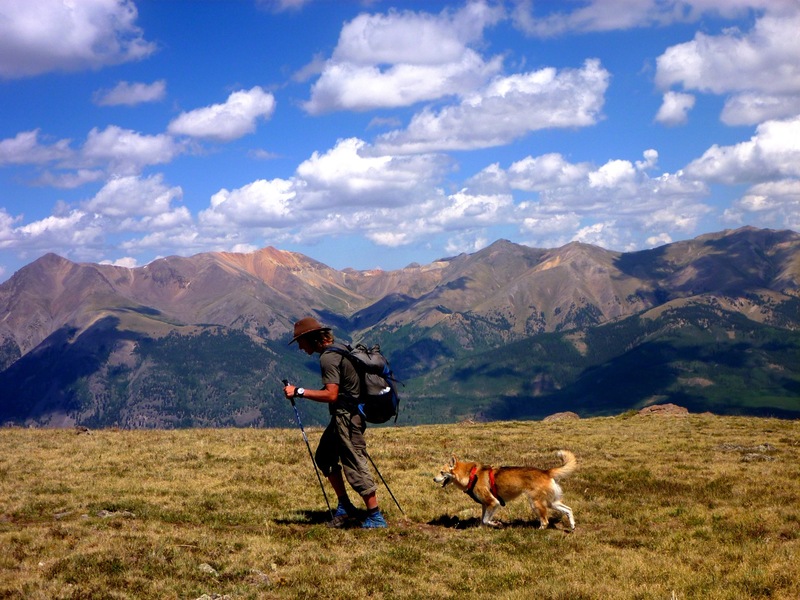 With that decision came relief…we could just hike. 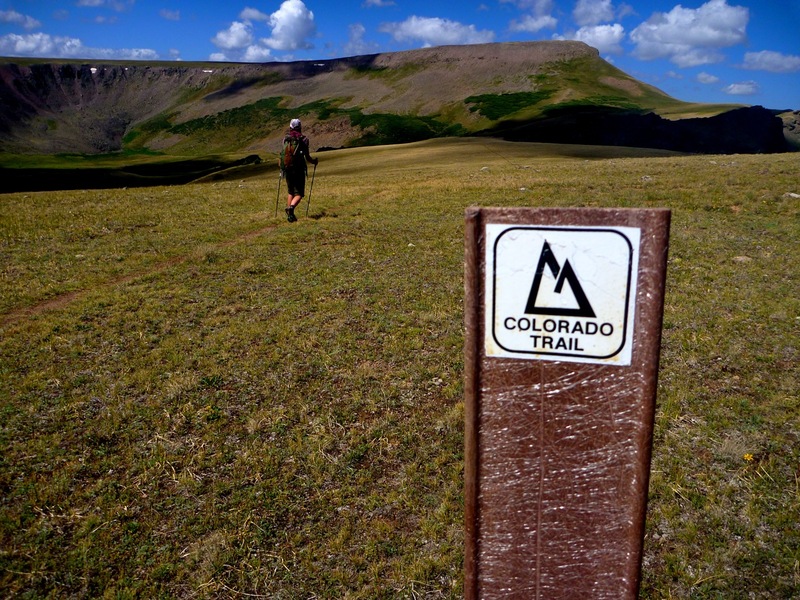 The trail descended the mesa before climbing some steep wooded terrain before emerging on a tundra ridgeline that constituted the highest portion of the entire Colorado Trail. I was having lots of memories here from that ride years ago with Whit, Steffan and Jack. It was a good day, but this was a better day! 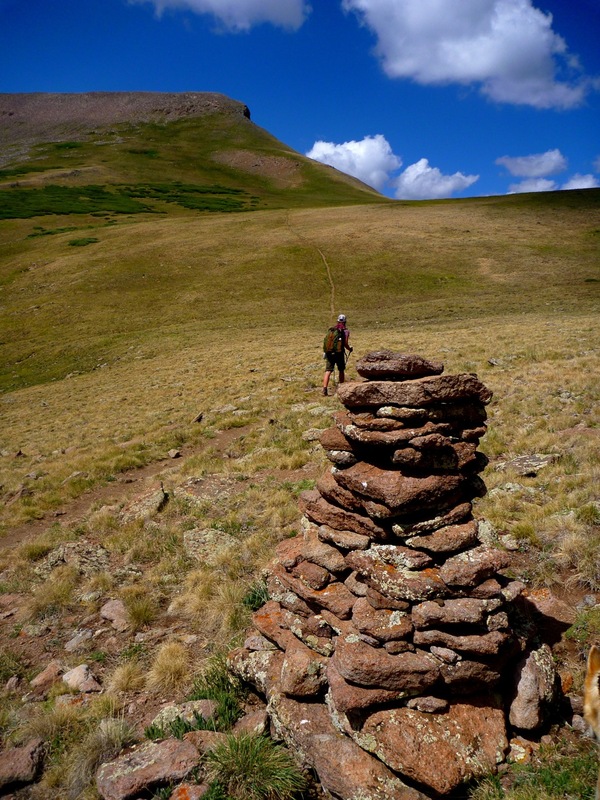 We came to a rise that we thought was was Coney Peak, the highest point on the Colorado Trail at 13,271 feet. 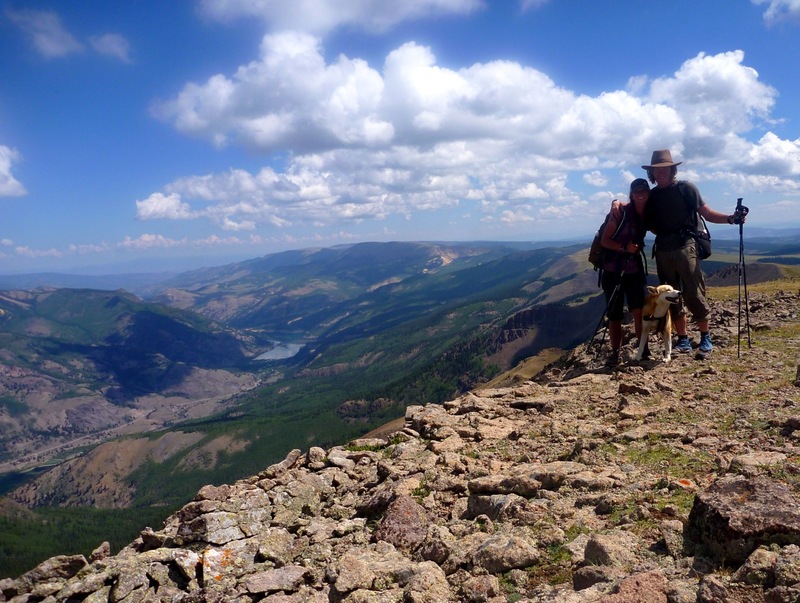 It was a steep, dramatic climb to the top of a small peak. It may sound cliche to climb a mountain and feel elation, but that's exactly what I felt. I think there was a full circleness to the whole thing. That day back in 2003 was a really, really good day…one of the best of that old life. Yet a lot has happened since then, and I couldn't help but be psyched by how far I've come since.. Climbing that hill today – it felt like I was back again, only this time much better. This time I got to share it with Elaine. I feel stronger, wiser, kinder and happier than I did back then. I have love and a partner who shares my passions and dreams. Climbing to the top of that hill today…that was a big moment in my life. In a sense, it closed the door on any remnant of a harder time in my life. Obviously the significance of Elaine topping out on that hill is huge as well. It's hard to believe how far she's come since 2007. 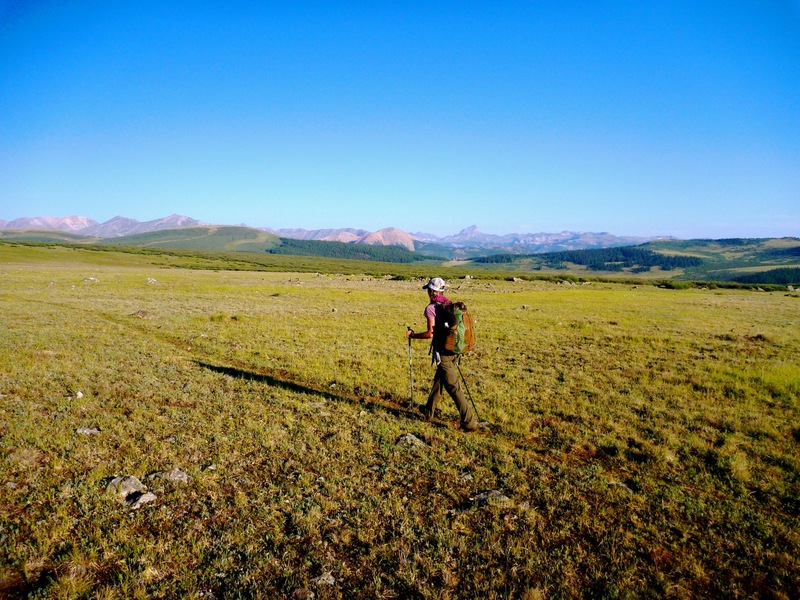 I'll be honest…since we've left Marshall Pass, she's been the protaginist on this Colorado Trail expedition. 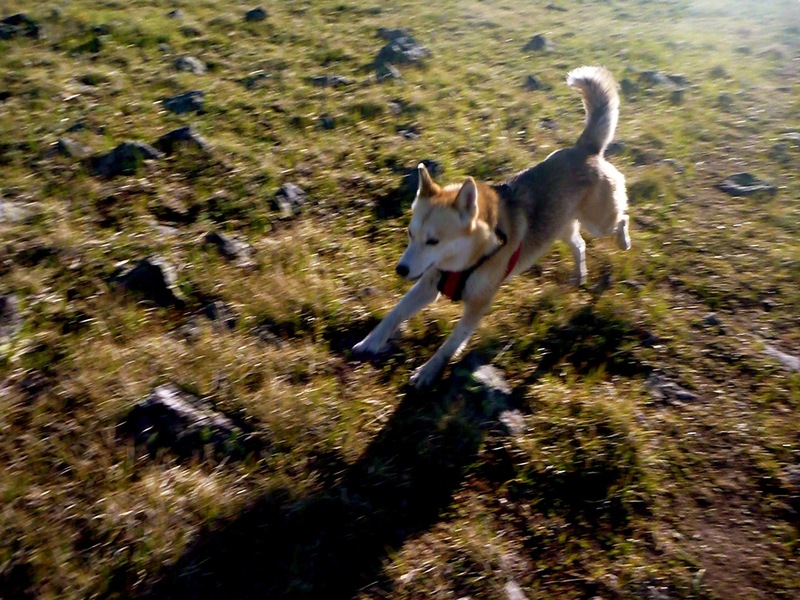 She is exceptionally talented out here, and she's a damned fast and strong hiker. I'll have to work to keep up with her in the coming years, and I'm psyched for that challenge because it's so good for me too. The key to staying young in my book? Marry a younger woman who you love (or young in soul)…her spirit will keep you energized and you will keep moving. You'll stay fit, you'll eat right, you'll do the things you need to do to stay raging for a long time. You have no choice! You owe it to her, and to yourself. And the critics will be easy enough to swat off, like the last lingering flies hovering by a window sill in mid-September. As the famous poet Robinson Jeffers has inscribed over his house…Bien faire et laissez dire. There is no question about it – we want to have a family – but there are other things we want to do as well. 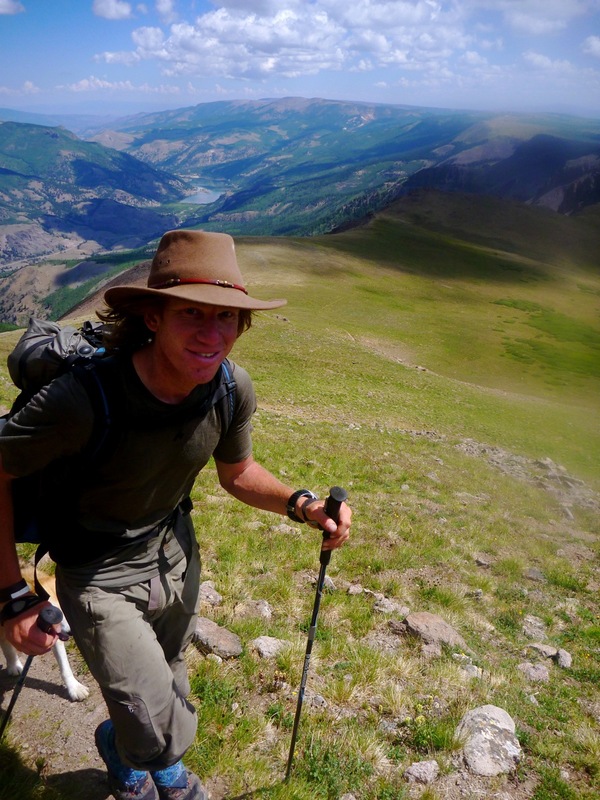 I think it's becoming somewhat inevitable that the triple crown – the Pacific Crest Trail, the Appalachian Trail and the Continental Divide Trail – is on our horizon. We've caught the bug. Being out here is so good. Not only is it good for your body, but it's good for your mind. It makes you dream big, but bigger than dreaming, it makes you formulate plans to put those dreams into action. With the skills we're developing, both in the outdoors and at work, combined with the strongest love I've ever seen and a genuine sense of teamwork we share, I believe we can do pretty much anything. The reality is, if we want to have a family, we also need to do things like hike the triple crown, ski Denali and write the best damned books in the world (and many other things we've discussed) now. Not in the next twenty years, but in the next three years. This is our time to do these thing, to be great for ourselves and each other so when we have a family there will be no regrets. When we come to that part of the journey, we want to be absolutely present, and we want to do it as well as it can be done. From the peak we saw massive mountains in every direction. Below up to the north was the Lake City valley and picturesque lake surrounded by towering summits. It looks more Switzerland than Colorado. This is the heart of the San Juans. These are, I will argue, the most magnificent mountains in the lower-48. The ski lines in every direction look simply incredible. This land – it's the heart of it all and it absolutely inspires. It is the best part of Colorado in my book. And now the humorous part of it all. After all the self-reflection I was feeling on the top of Coney Peak, it turned out that we weren't even on Coney Peak! That was a few ridges beyond, and was actually quite anti-climactic…barely a roll on the divide. I prefer our personal summit much more. And then the contrast. 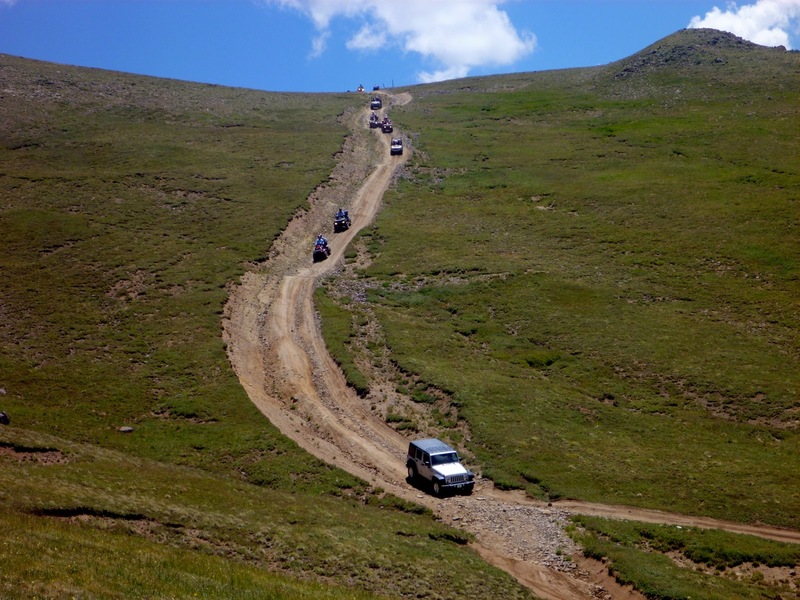 As we headed down to Carson Saddle we were greeted by throngs of ATV riders. While the moto riders on Marshall Pass seemed like passionate outdoor users who possessed real skill, the ATV riders looked silly, like tourists who don't belong out here. They laughed at our haggard look, and it's just as well. They reminded me of the characters in "Call of the Wild," the southlanders, who tried to take a dog team to the north and get rich but instead just fell into a frozen lake. Riding ATV's takes little skill. The first and only time I rode one, helping to pull flagging on a mountain bike course up in the Yukon, I was able to go 50 mph on rough trails with zero effort. They're a cheap thrill, but they have consequence. The land is badly scarred in this part of the San Juans by the use of ATV's. After spending nearly 20 days out here and living on this trail, drinking from it's streams, suffering up it's hills and feeling it's beauty and power, we find ourselves becoming fiercely possessive of it. It becomes your home, and nobody likes to see their home trashed by carelessness. I'm being overly critical of the ATV's. I wish, for a week, we could take the riders of those things on a hike. They might hate it at first, but they might love it too. One girl riding on the back of one seemed to be kind of looking over at us, almost whistfully. Her look seemed to convey the thought, "that looks like fun, get me off this thing." We thankfully headed off Carson Saddle and onto trail again. The trail rose to a pass, and thunderheads were building rapidly. In all honestly, we probably should have taken cover and camped, but as lightning wasn't striking yet, we decided to head up and over the pass and hopefully make it to a small lake on the other side. 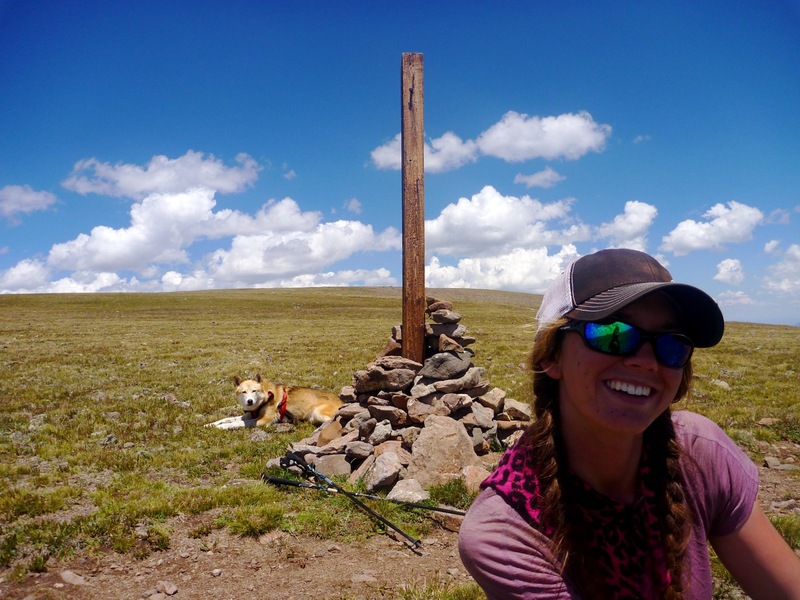 Elaine pushed a brutal pace to the top, alternating between exceptionally fast hiking and running, always fun on a steep loose hill at 12,500 feet above sea level with a 25 pound pack. It took everything I had to keep up with the pace. She later told me the adrenaline of potentially getting struck by lightning kicked in and any pain of moving so fast evaporated. If we'd skied the Elk Mountain Traverse at that pace we certainly would have been a lot quicker than we were! Like I said, she's madly talented out here in the hills, more than any girl I've ever hiked with, more than just about every guy I've hiked with too. 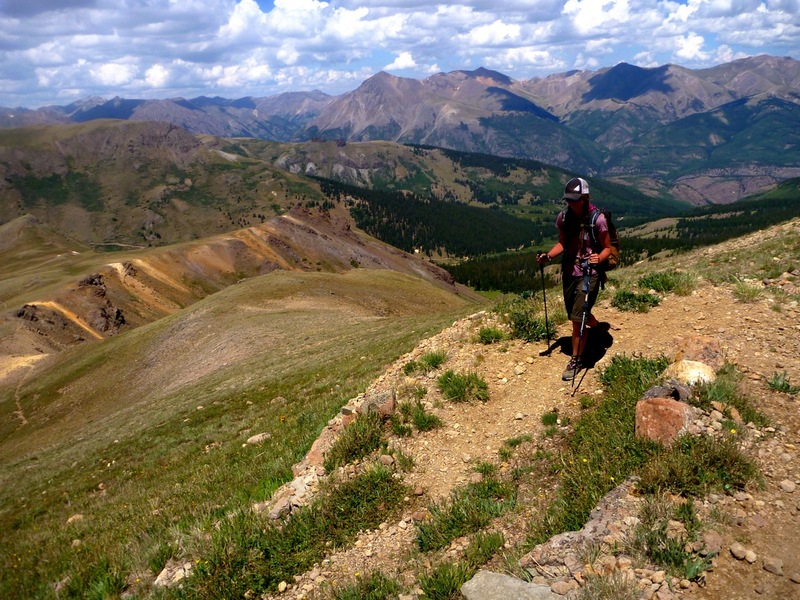 We reached the top of the pass and got frustrated by the trail that seemed to refuse to drop down off the ridgeline. The sky was exceptionally dark, we were starting to here thunder in the not-too-far distance and we didn't want to die. We decided to drop off the trail straight down a steep hillside to a big lake below. It was hell travel, through willows taller than either of us, falling, hanging onto bushes, getting scraped and bloodied. By the time we got to the lake, we were cooked. Alas, all the ground around the lake was swamp land, which was frustrating, but the only way to make the situation better was to keep moving. We headed up a valley that reintersected with the trail at a small lake. This lake had solid ground, and despite the fact that it was full of millions of little swimming worms (the lake had no inlet or outlet), it did provide water. We set up camp, cooked dinner and hit the sack, trashed both mentally and physically. Alas we were not that protected…there is no protected terrain up here…so it was extremelly disconcerting when the biggest thunderstorm we've seen on the entire trip decided to move in at 2 am and sit directly on top of us for a couple of hours. We huddled, curled deeper in our sleeping bags, and prayed. That’s Cataract Lake that you stopped at.